I have done my Bat-Mitzvah project on the fascinating life of Mr. Alvin Grollman. Born on May 2, 1925, he might be the oldest member of this congregation. He was born and raised on the Eastern Shore. His father had a general store on Kent Island, and then in 1915 he bought a 167 acre farm on the Chester River in Stevensville. Mr. Grollman never was interested in working in the family store. He has worked on the farm all of his life, except for a job at an Acme market for a brief time when he was 17 years old. Although he always worked with his father on the ranch, he lived in town. He finally moved to the ranch in 1951 with his wife to take over farming and cattle ranching because his father was getting too old to run it anymore. That is when he started buying the cattle. He has lived there every since, and continues in his 90’s to buy cattle to sell at auction. Mr. Grollman had a happy childhood. His parents were orthodox Jews from Lithuania. His father was the youngest, and had three brothers. His uncles came to America first, then his father came over with his parents. His father’s parents came with nothing, and started a business here. Mr. Grollman had four brothers and one sister, and all children were born at home. He was the youngest, and is the only surviving sibling. His sister and one brother settled in Baltimore. The other siblings farmed and one went into banking. Mr. Grollman’s uncles all had separate farms in Stevensville, except one in Kent County. I asked him if anyone in the family wanted to go into business with him at his ranch, and he told me that he never wanted to go into business with a family member, because family needed to be separate from business. Evidently his brothers and sister agreed with him but, he explained, they were always there to help each other. His mother was very smart, and worked the store while his father was buying cattle. She made all the children’s clothes. When his mother came over from Russia, she settled in Bluefield, West Virginia of all places! One uncle had three successful furniture stores there. She eventually moved to Maryland because she had family here. Mr. Grollman talked about life on the Eastern Shore in the early 1900’s. There were about 50 Jews (which were about 42 more than I though there would be!) They all owned stores and farms, and the non-Jewish neighbors were very friendly and didn’t care that his family was Jewish. Everyone loved his father, and everyone had respect for each other. His father had a way with people, which must be where Mr. Grollman gets his wonderful personality from! Mr. Grollman spoke about what it was like to be Jewish back then. His family lived in the country, so the closest shul was in Baltimore. His parents would close up their store for the Sabbath and take the boat to Baltimore, where they would stay with an uncle. Mr. Grollman was never bar-mitzvahed. He learned Hebrew from a teacher who came to live with the family when he was young. At the age of 14, he met a man who would teach him Hebrew at the tavern he owned in town. His family started going to Temple B’nai Israel when it was first built. He agreed that it is really time for a new synagogue, since this one is falling apart. Mr. Grollman keeps a kosher home, just as his parents did. He is very insistent that pork never comes into his home (Needless to say, I didn’t tell him how much I like bacon!) He still has a Passover seder at his home every year, and said that the tradition has been going on for 100 years! His parents used to have a seder on both nights, but he only does one. He talked about keeping kosher, and that he gets his holiday food from Baltimore. His family used to get food shipped on a bus from Baltimore packed on ice. He remembered buying fresh-killed chickens. Mr. Grollman graduated from Stevensville High School in 1942. He was going to college at the University of Maryland to study to become a large animal vet, but had to come home and help his father with the ranch when the war started. He didn’t have to serve in the war because of his agricultural status. His brothers were all in the war, which made his mother very anxious and very lonely, but, luckily, they all came home in one piece. One brother served in Africa, one in Hawaii and one it Italy. One of his brothers was the first to serve from the Eastern Shore. He left here with another boy who unfortunately was killed at the Battle of the Bulge. 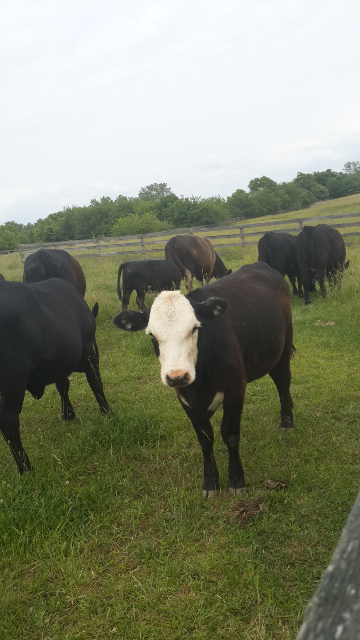 At the time he came home to help his father, they had about 80 cows! He never had any regrets about not going back to school, as he was and is very happy on the ranch. He was married for 53 years to a wonderful nurse who sadly died in 2004. He met her through his sister, who also was a nurse and worked at a hospital in Baltimore. It was love at first sight! They met in March and married in August of the same year. The Grollmans’ had six children, all girls! He has eight grandchildren. His youngest daughter lives with him, and his other daughters live either on the farm or close by, except for one daughter who lives in Boston. He is the only Grollman left in his family, since he had all those daughters and no sons! All of his siblings married Jews, as they never would have thought about marrying anyone else. It was all right to dance with a non-Jew, but not to marry one! His wife and one of his daughters went to Israel, but he’s never been. 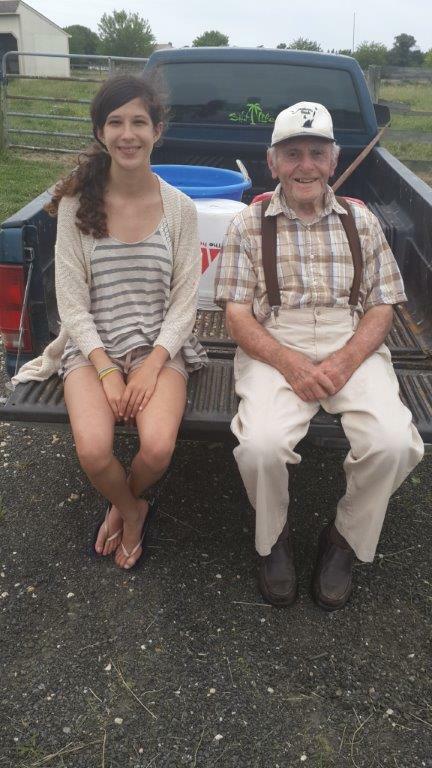 He’d like his grandchildren to visit Israel and reconnect with their heritage. He said that maybe he’ll go next year! He’s been to Hawaii three times, and loves it there! He’d love to visit Lithuania, but said that it’s too dangerous there now. When he spoke about cattle ranching, he had a gleam in his eye. He attributes his longevity and good health to working outdoors his whole life and doing what he loves to do. It was clear that he loves animals as much as I do. He currently has 20 cows. He knows more about cows then anyone I’ve every met! He doesn’t drive the cattle truck anymore, and has a man helping out. He used to have horses in the 1940’s, but got rid of them when his father bought tractors. He used to ride his horse “Buck” on the weekends, and talked about him fondly. His daughters rode for a while, but he said that stopped when they discovered boys! Personally, I would rather ride horses! He was very interested in hearing about my horseback riding lessons, and wanted to know all about the horse I ride. He also had chickens, and his wife sold the eggs to the American Legion. But they couldn’t continue to raise chickens because raccoons and foxes were killing them. They had sheep, too. We had a very interesting talk about the different breeds of chickens. He even suggested that I raise some chickens myself, which may not be a bad idea! When my mother and I pulled up in front of his house, the first thing I noticed was a flock of wild pigeons across the road in the field. They were hanging out with the geese and are evidently a common site! Mr. Grollman told me that they come from under the Bay Bridge to eat in his fields. He has a wonderful dog, Gordie, a lab-greyhound mix, who spent the afternoon of the interview sleeping on my feet. Mr. Grollman took us up to the barn (Gordy had to run ahead of us, of course!) to show us the cows, as he knew how much I love all animals. It was wonderful! I got to be right in the middle of all of them, and I learned a lot about the different breeds. The calf was my favorite. All the cows were very friendly and enjoyed having their necks scratched! I asked him what he thought of the changes he’s seen in his lifetime. He said that as soon as the Bay Bridge was built, the area got much more crowded. And when they built the second span, it got really crowded, and the traffic got to be awful. It was very inconvenient for the residents. He talked about the days of the ferries, and wished they still ran, and said that it was a lot better here long ago. He said that it was much easier to be in business back then, because there wasn’t the competition that there is now. 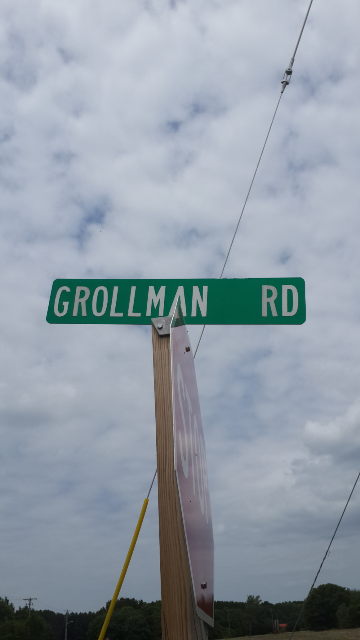 I asked him about the name of his road, Grollman Road. One of his brothers become a county commissioner (he was the only Jew) and renamed the roads after the families that have lived on that road the longest. He talked about his road 70 or 80 years ago, when it was called Chester River Road. A boat would dock at the end of the road to haul produce and supplies grown here to be sold in Baltimore. I asked him if he minded being interviewed, and he said not at all, that he enjoys it. He was previously interviewed for a book about the history of Kent Island, and a book about the Jewish Museum in Baltimore. He wasn’t crazy about the author, since she never mentioned anything about Temple B’nai Israel! It’s nice to know that he has such love for this shul Mr. Grollman’s advice to me as a young Jewish person was to always keep my Jewishness and always be proud of being Jewish. He told me that it is very important for me to be Bat-Mitzvahed, because it is such an important milestone in my growing up, and that I will be very glad I did this. He told me how important it is to learn to say the prayers in Hebrew, which is something he still does. He said that if anyone ever says anything negative to me about being a Jew, I should remember what his mother told him and he never forgot – “Sticks and stones will break my bones, but names will never hurt me.” He said that it worked the few times in his life that he encountered anti- Semitism, and that I should remember it always. I asked him if he encountered any anti-semitism growing up on the Eastern Shore, and he said hardly any at all, that everyone was very nice. Mr. Grollman told me that, “it’s been a good life – the Lord’s been good”. I hope I’m able to make that statement when I’m 90.